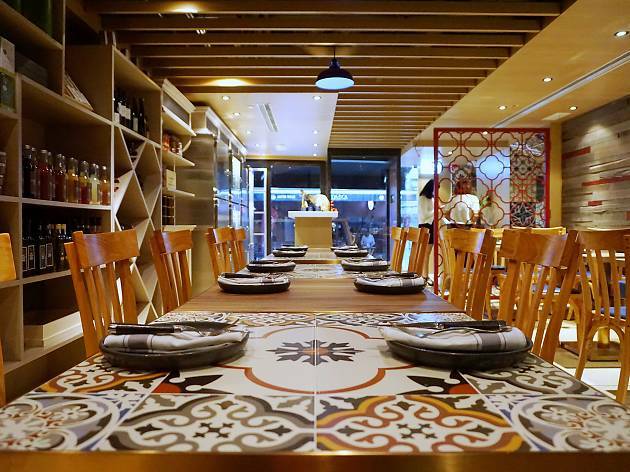 Occupying the space that once housed Chicha comes Cochin. The upper level of the restaurant is a dining room while the lower level showcases an open kitchen with a more casual area with a bar to grab a drink and a bite. 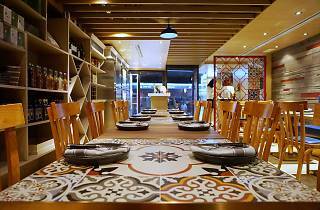 The restaurant's decor is warm and rustic, creating a relaxed atmosphere but it’s the beautiful Mediterranean wall tiles that really stand out. We have high hopes given Chef Renaud’s CV but are always a little sceptical of another French restaurant in Soho. The deli looks promising but we’re here for dinner and start with the rabbit mini burgers ($115). The burgers are mini indeed but the gamey meat is hearty, and well complemented by the pickled carrots and sweet bacon. For mains, we opt for the organic Welsh lamb pot au feu with anchovy herb dressing ($235) and the miso ‘jerk’ black cod with wild garlic and mushroom consommé. Both dishes are generously portioned and the Japanese-style cod is cooked to perfection but lacking in flavour. We discover that the ‘jerk’ element is the cooking style as opposed to jerk seasoning and save for the satisfying tang from the vinegary shiitake mushrooms, the dish doesn’t pack much of a punch. The lamb is tender but slightly overdone for our liking. And while we thoroughly enjoy the anchovy herb dressing, there just isn’t enough of it. Though our mains are pleasing, we can’t help but long for more distinct flavours and seasoning. Fortunately, the lemon meringue tart with lemon sorbet ($100) absolutely knocks it out of the park. The tart citrus centre is balanced by the perfectly smooth and almost creamy meringue, sat atop a crumbly tart base. The sorbet is a palate cleansing pleaser, stripping the acidity of the lemon from our tongues and leaving us refreshed. Our high hopes for Cochin aren’t reached - but they’re not completely dashed either. We hope with a few tweaks that the dishes can flourish, but maybe it’s best to stick to the deli and bar for now.